It’s been super cold here that I avoid heading outside. The wind is just brutal! When I do step outside, I wear so many layers. 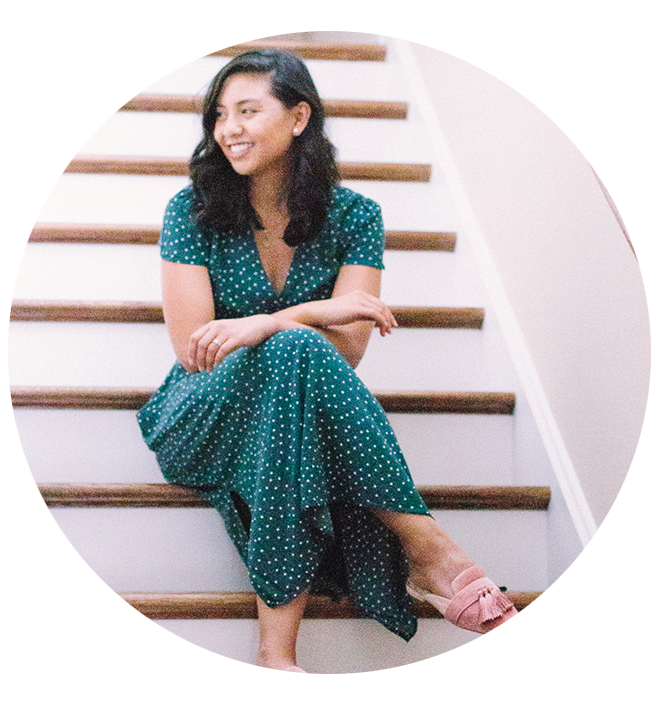 In this outfit, I wore a boyfriend shirt on top of a thick knitted sweater and then my coat. I can’t forget about my blanket scarf. Those scarves are a life saver! All that fabric means more warmth! 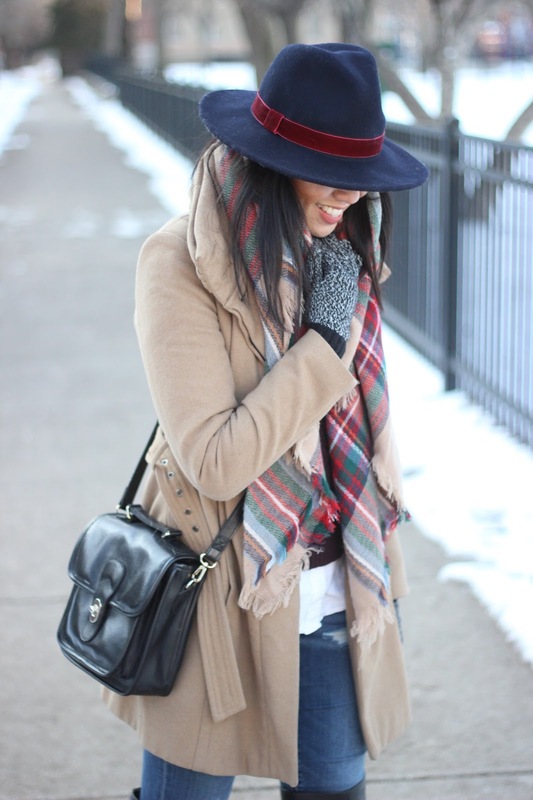 This fedora hat helps block the wind chill and is a great way to look chic during winter! Do you guys have any tips on staying warm during Winter? This is such a cute look! I love your hat and coat! Great layering! 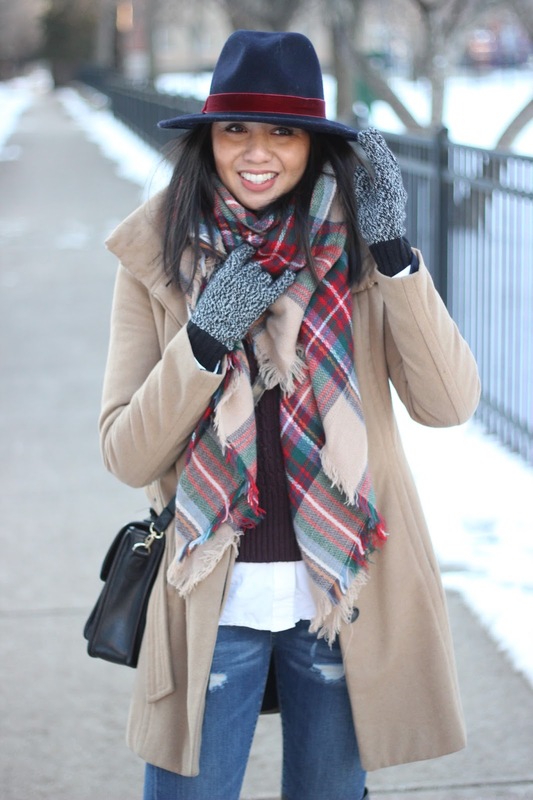 The only way to take blog pictures lately is all bundled up! Thanks Amy Ann! And it is oh so true! What a cute and cozy look! Love the colors of that great fedora and how well it compliments your scarf! Have a wonderful week ahead! Amazingly cozy and chic look!!! When it's this cold, it's definitely all about the layers! I love how stylish you look, even though you're all bundled up. Stay warm!! It is so true! Plus, there was no way for me to take a photos outside without being bundled! Loving those layers, Rach! The scarf is my fave! You look so cozy and chic! the hat and scarf match so well! love this layered winter look! You look so warm and cozy! Definitely a necessity with these cold temperatures! Love the scarf! Thanks Rachel! It's definitely a necessity! So cute! The pale color on your coat is so gorgeous, just the perfect shade! 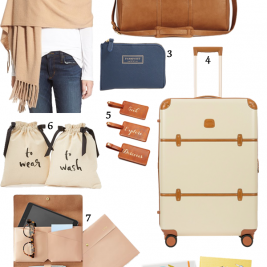 I still haven't found my go to camel color yet, still searching for one! I have the same blanket scarf, and I'm in LOVE with your hat! What a deal. Isn't it the greatest?! Plus its super affordable! Thanks Samantha! It was great seeing you too! Perfect layering in this look! Love the velvet ribbon on the hat and that jacket looks so warm and comfy! This weather is definitely not picture friendly! Love your layering and LOVE your hat! Thanks Heidi! It really isn't ugh! I've been dying to get my hands on a pair of gloves like this! Thank you so much for sharing Rach! So glad I can help! Hope you like them! My goodness, the weather sounds brutal there. Sorry to hear that. 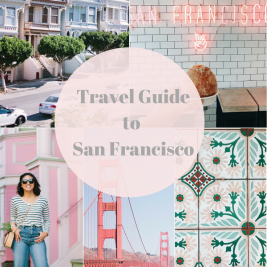 On the positive end, you get to wear cozy layers, rich tones and stylish layers all why trying to stay warm. I see you've mastered this the look. It really is! Thanks so much Shoshana! Love the scarf! Great look! you look so cute and cozy! I totally agree with you that hat makes the outfit! Something I do to keep warm (more functional than fashionable) I wear workout leggings under my pants. It adds a nice layer of warmth and they are so thin that they dont cause discomfort or bulging under your pants. It really feels like an extra layer of skin. Stay warm! loves! Love that idea! Def will try that! So cute! I love this look it's a perfect go to for cold weather! 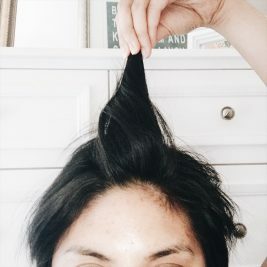 Loving your layers. That scarf and hat are perfect together! Too cute! Love this outfit! And you look like you are having so much fun! 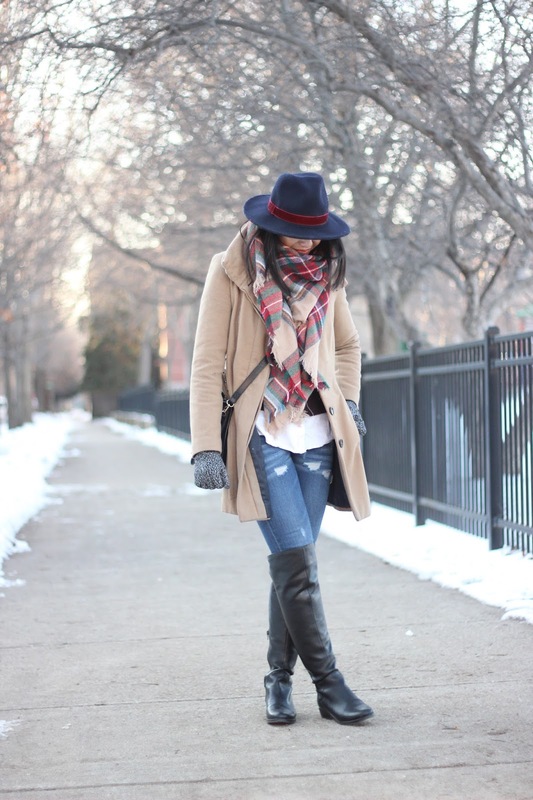 Beautiful hat and scarf, amazing style, love this post! I've actually earned the nickname queen of layering as it's the technique I also use most during winter to keep warm and look stylish 🙂 Love your outfit! That is awesome! 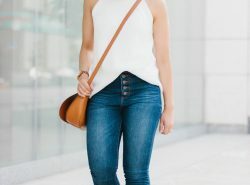 So much benefits with layering! I love it! I've got a similar scarf for Christmas and I wish I could wear it as good as you do! Love the color of the coat, so chic! Bonjour from France, Sand. Your layering skills are top notch! Love your bag! My Coach Willis is one of the most versatile bags I own. Thanks Julia! It's such a great bag! love it! red is so nice! wanna support each other? I love all the elements going on over here! 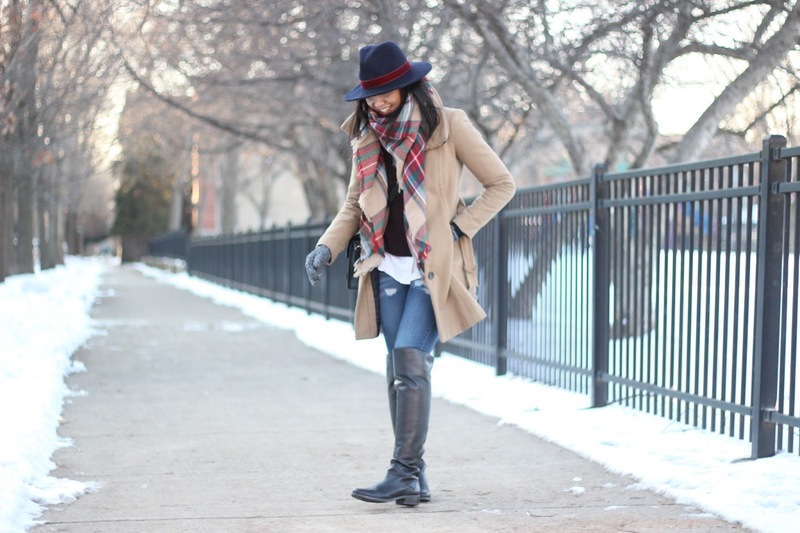 The blanket scarf, the hat, the boots…Perfect colorful winter outfit, Rach! Thanks Ileana!! I'm doing my best to stay warm! Blanket scarf is a must for cold weather! You look very lovely. I love how warm this looks!! Whoaaa strong layering skills! I totally agree, wrapping up in endless jumpers and scarves is the only way to go in this weather. I tend to opt for oversized coats so I can stuff extra layers underneath! Thanks so much Betti! I'm a huge fan of oversized coats as well! I would totally wear this outfit <3 I love the hat and the scarf together! Such a cute outfit! I love how you styled it! Scarves are so chic and fabulous! Love ur hat!